Owning a home is tough, but these 41 house hacks will make life a bit easier. 1. 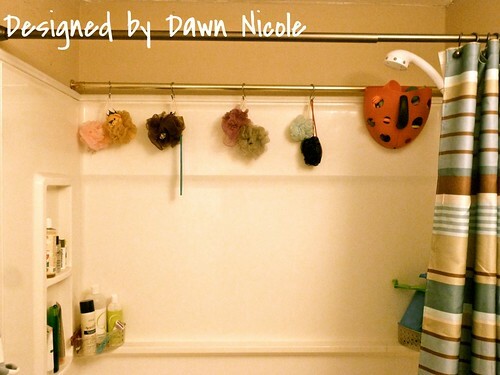 Use old door knobs for hanging towels. 2. A hinged painting is perfect to hide the thermostat. 3. 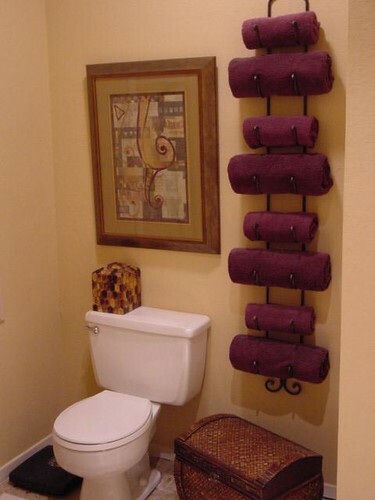 Display bracelets on a paper towel holder to keep them organized. 4. Use old drawers for creative shelves. 5. 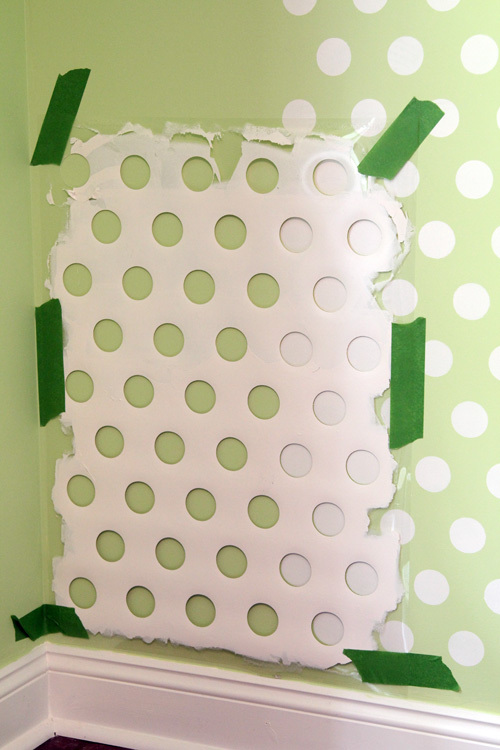 You can use an old laundry basket for polka dot walls. 6. Wine racks make great towel holders. 7. A shoe organizer is perfect for the pantry. 8. Use two coat hangers to hang your ironing board. 9. A cheap CD tower turned on its side makes for a great bathroom organizer. 10. Magazine racks are great for can storage. 11. Use a drink dispenser if you're tired of looking at that ugly Tide bottle. 12. When you paint a room, put some extra paint in a baby jar and keep it handy for quick touch-ups. 13. Use an extra shower curtain rod for extra storage. 14. Hide your spare key in a medicine bottle with a piece of a pinecone glued to the end. Then bury it. 15. Dry erase marker on glass makes for a great alternative to ugly white boards. 16. Use a shelf when storing narrow items in deep storage spaces. A phone book also works: now you can see everything. 17. Tie some Eucalyptus to your showerhead. It will make an amazing fragrance with the steam. 18. Foam noodles in your garage can save your door and the wall. 19. Plastic hangers make great storage for cords. 21. Ice cubes can take indentations out of carpet. 22. 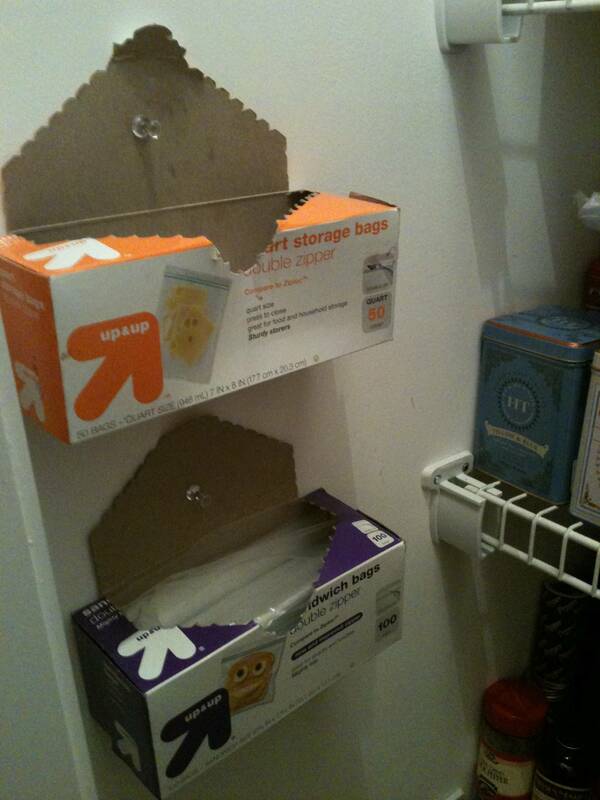 Tissue boxes can keep plastic bags organized. 24. 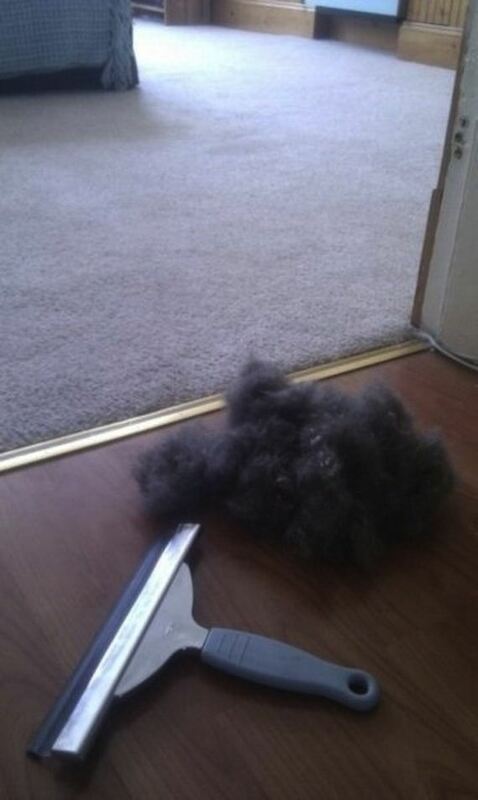 Use a squeegee to remove pet hair from carpet. 25. Use Press'N Seal wrap instead of having to tape everything. 26. A ball of aluminum foil makes for a great reusable drier sheet. 27. 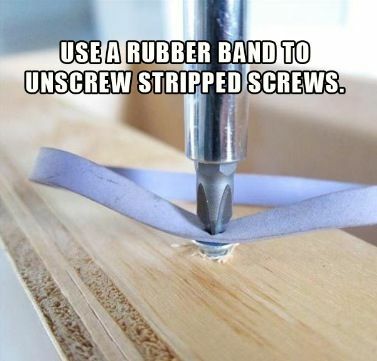 Use a rubber band for stripped screws. 28. Use acrylic-latex caulk to keep rugs from slipping. 29. Use thumbtacks for your garbage and storage bags. 30. Use Christmas lights if your closet has poor lighting. 31. 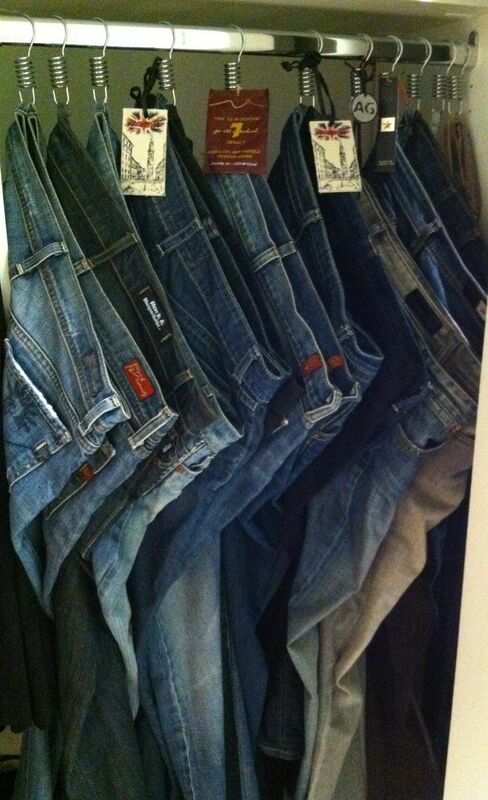 Hang your jeans on shower hooks to make them more assessable. 32. Keep water bottles and travel mugs from falling out of your cabinets. 33. Put a magnet strip under your cabinets to store spices. 34. Use letter organizers to store flip flops or flats. 35. 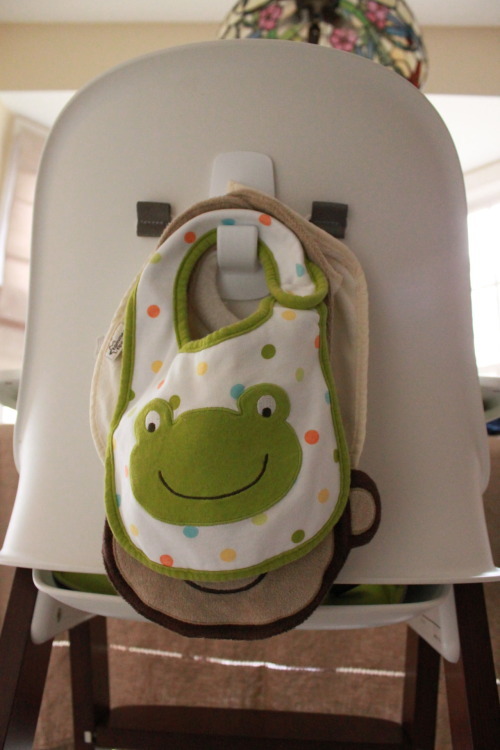 Use a command hook behind your high chair to hang bibs. 36. An easy and literal bookshelf. 37. A simple way to disinfect Legos. 38. Glue a magnet to the bottom of your hammer so you don't have to hold your nails in your mouth. 39. You can save money by using "Swiffer Socks." 40. 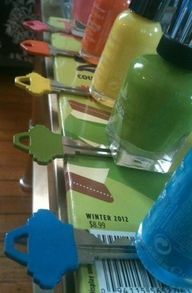 Use nail polish to differentiate your keys. 41. Use crown molding as a place to store your heels.